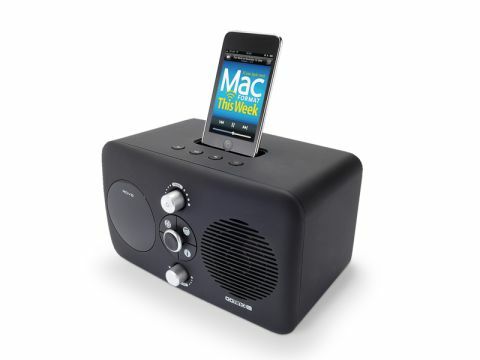 A compact and stylish radio and iPod dock, but can it match the iBLIK? Available in black or white, Revo's Domino D3 multi-format radio features a rubberised matt finish giving it a curious retro yet-contemporary style. It looks cool enough to sit comfortably next to your computer, but doesn't look out of place in a more traditional living space. Connecting wirelessly to the internet gives you access to over 11,000 streaming broadcasts. You can also stream music from your Mac or from Last.fm, but curiously, not Spotify. The device comes with a 30-day subscription to Last.fm, after which the service costs £3 a month. Terrestrial digital radio through DAB and DAB+ is also catered for, as is FM radio, via Radio Data System (RDS), whereby the Domino can display small snippets of information digitally embedded into FM broadcasts, such as station identification, programme information and more. There's an iPod dock too. Compared to the iBLIK RadioStation, the Domino D3 lacks Ethernet connectivity, an earphone socket and ports for connecting external speakers. However, it does benefit from an OLED screen (albeit a small one), a better remote controller, Last.fm and full iPhone compatibility (no need for Airplane Mode), but the RadioStation offers a warmer, more complete sound. For us, this tips the balance in the older machine's favour – unless you're keen on Last.fm. Also available are the DAB and FM-only Domino D1, and the Domino D2, which offers Wi-Fi internet and FM radios. All Domino models include iPod docks.